I will be generous and keep an open hand as well as an open heart. I will keep an open mind, ready to learn new things and to deepen my understanding. I will not allow fear, disappointment, or resentment to cause me to give less of myself to others. I will allow forgiveness, grace, and generosity to mark my words and actions. 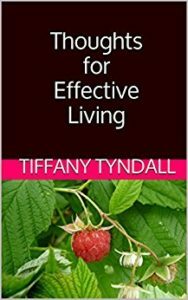 Thoughts for Effective Living by Tiffany Tyndall is available for purchase here.